The Project Risk Analysis program enables the capital risks on projects to be evaluated, and calculates the financial contingency required to cover those risks in a rational and defendable manner. Too often the project contingency is guesstimated as a "gut feel" amount, without much consideration for the real risks involved. The procedure followed in PRA encourages disciplined estimating, and calculates the required contingency using the proven statistical method known as Monte Carlo Simulation. Although PRA uses sophisticated statistical techniques, it has been written for project professionals who are more at home with estimating and costing than with statistics. 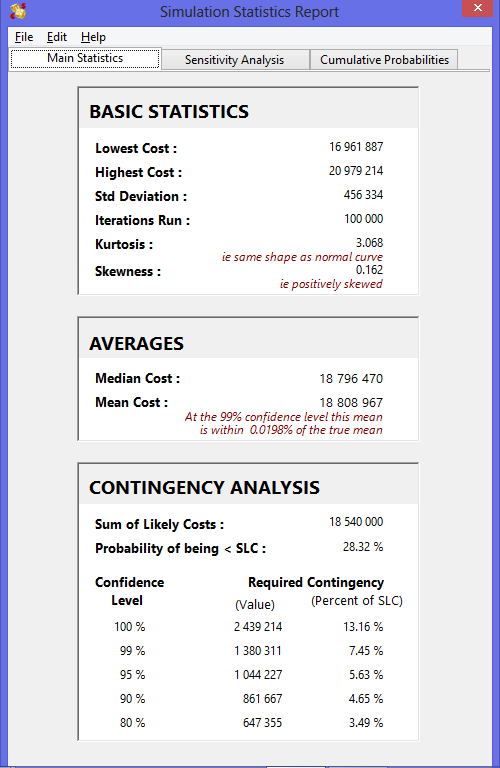 All the statistical models and distributions required have been specifically set up for contingency analysis and no knowledge of statistics is required. A tutorial on using statistical distributions and the Monte Carlo Method in capital cost estimating is included in the built-in help file for those who like to know what is going on under the hood. The cost estimate can be imported from a spreadsheet with a simple Copy and Paste, or it can be manually entered and edited within the program itself. The results calculated by PRA can be displayed in easy-to-read graphical formats that quickly and effectively give the estimator an overall appreciation of the risks. These graphs are also ideal as support documentation for presentations to senior management in the justification of requests for contingency funds. The results are also available in detailed tabular format. The extreme speed of analysis allows you to carry out your risk analysis in real time. A full Monte Carlo analysis with 100,000 iterations will typically take less than 5 seconds. Apart from the graphical and tabular reports generated by the program, you can export the reports in a variety of formats to suit spreadsheets, text documents and graphical editors. The raw data can also be exported for further processing or report generation in other applications. Exported data can be saved as files, or via the clipboard for pasting directly into other applications. Version 3.0 of PRA will read the data files created by previous versions. 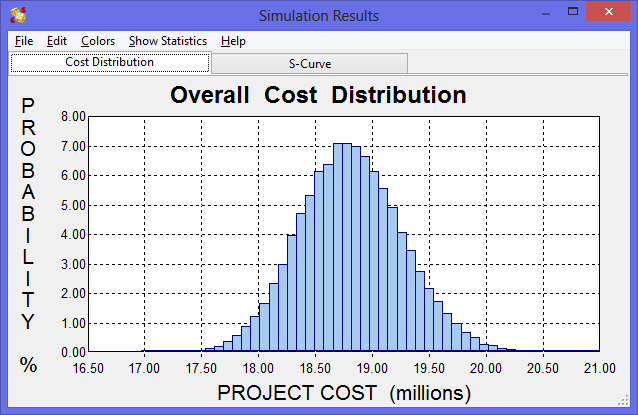 If you would like to read some background material on using Monte Carlo Simulation to predict project costs and how to avoid cost overruns please see this article. The cost estimates and distributions are specified for each category in the estimate. The entire project is simulated thousands of times using the Monte Carlo Method and the total project costs are graphed on a histogram. This clearly shows the range of costs that can be expected for the project. This data can also be shown as an "S-curve". The simulation results can also be displayed in a variety of tabular reports to allow the applicable contingency level to be selected. Testing Project Risk Analysis is risk free. Download and test the free trial version before you make the decision to buy. After your purchase you are covered by our 30 day money back guarantee. No questions asked. 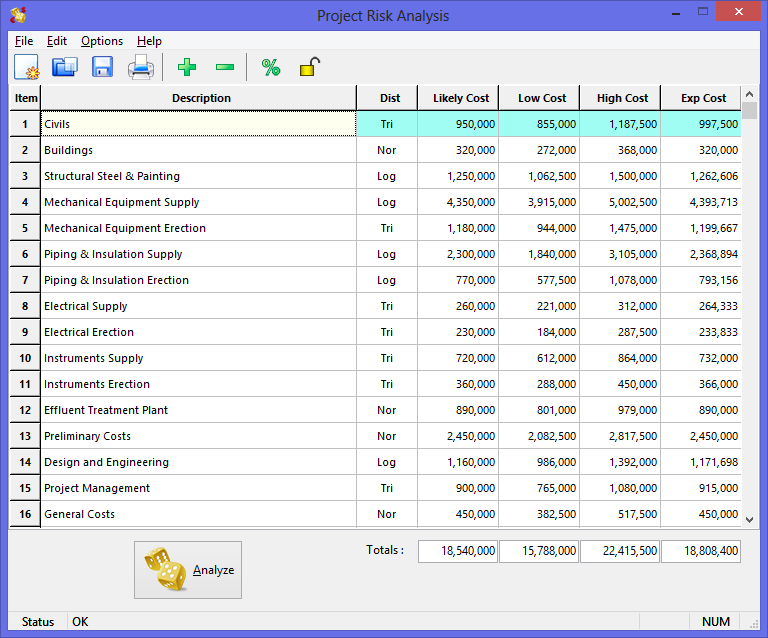 And if Project Risk Analysis is upgraded tomorrow you get that free too. In fact all upgrades are free for 12 months after purchase. No risks, just great software. PRA is distributed as a try-before-you-buy evaluation version. You can freely download and use the evaluation copy of PRA to determine its value and usefulness to you. The evaluation version of PRA will allow you to run it 15 times. The evaluation version includes the full calculation functionality of the paid version, but some of the printed and exported reports do not contain all the data. If PRA does not meet your needs or standards then it has cost you nothing and you simply uninstall it from your computer. PRA can be bought in a range of license options, and the prices depend on the option you select. Please see the purchasing page for details of the prices and purchasing procedure. When you purchase the full version, you will be emailed a license key file which will convert your evaluation version to the full version without limits and restrictions. The license file will work with all upgrades released within 12 months of original purchase. If you pay by credit card you can receive your password within a few hours.